Investors have completely given up on gold and gold miners. 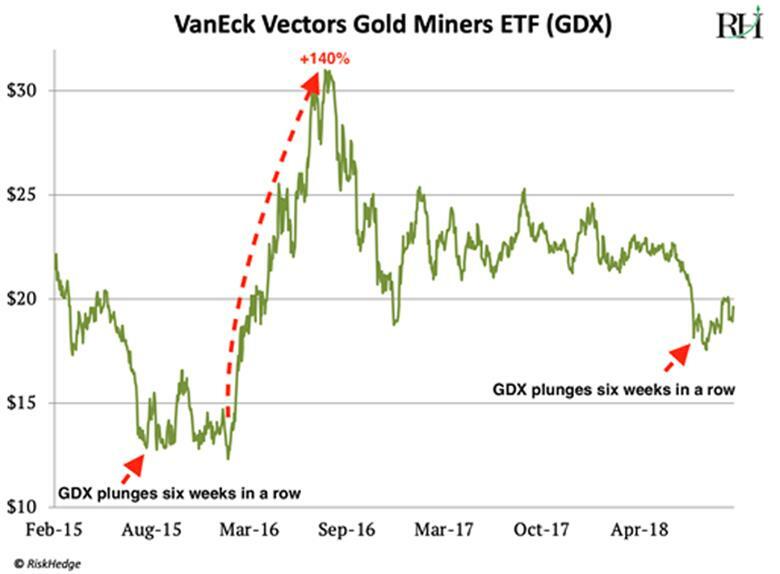 The VanEck Gold Miners ETF (GDX), which tracks the performance of gold stocks, closed lower for six weeks in a row. That almost never happens. If fact, since the creation of GDX in 2006, it has only happened twice. Do you see what happened next? GDX bounced around for a few months before soaring 140% gains in eight months. Last month, professional traders were “short” gold more than any time since 2001! 2001 was the beginning of the last great gold bull market. In a decade, gold rallied 630%. The 2001 bottom also prompted a 1,350% surge in gold stocks. This year, investors have yanked $3.5 billion from gold-related ETFs. That’s the highest level of withdrawals in five years. To get an insider’s look at the market, I called up Adrian Day of Adrian Day Asset Management. But buying hated stocks is one of the lowest risk ways to make big profits in markets. Now, gold may lack the excitement of the disruptive technologies I often write you about. I understand. Self-driving cars, DNA mapping, and the coming superfast 5G cell phone network are much “sexier” than gold mining stocks. Meanwhile, gold has held its value for thousands of years. Gold miners are a supercharged version of gold. Even a modest move in gold can push gold stocks much higher. As I mentioned earlier, when gold jumped 30% in early 2016, GDX shot up 140%.